Do you live next to or near an oak tree? If so, you are looking at a ready source of nutritious food: Acorns! Yes, acorns. You read correctly. 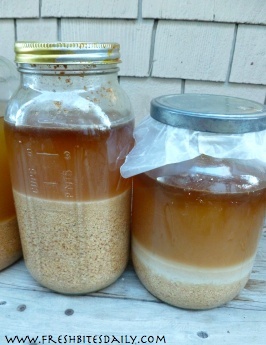 Keep reading and you will be amazed at how easily you can bring this free and ancient food source into your cooking. California is wealthy with oak trees, many varieties of them. Acorn harvests and wild game kept Native peoples well supplied with food. This is part of history in many of our States. Acorns were a diet main-stay and still could be. Today most folks consider acorns an annual fall clean-up problem. There are not enough birds or squirrels to carry off all the acorns which can cause hazardous walking conditions. Slip once on freshly-fallen acorns and you will consider them a scourge. If you avoid the fall acorn problem you may spend spring pulling oak tree seedlings out of your lawn and you will develop some hard feelings toward this over-looked food source. For decades I have considered the fall leaf drop to be a valuable harvest. We’ve treasured all the leaves we could get our hand on, using them as mulch, digging them into garden beds and compost piles. This fall we were picking up mountains of oak leaves that had been neatly wind-rowed. It was the motherlode! We scooped leaves from the tops of the rows, exposing gigantic, freshly fallen acorns. Dan, who had wind-rowed all these leaves, didn’t argue. Instead, he captivated me for the next half hour with acorn stories from his growing up on a reservation in Oklahoma. The girls helped grind acorns while the boys raided bee hives for honey to sweeten the acorn bread. His eyes danced and sparkled as Dan recounted the stories. These were obviously treasured memories. In my next encounter with Dan he told me how his Korean neighbors were out harvesting acorns. I was reeled in — I couldn’t miss all of this fun! The next day we began harvesting the crop. Read on to see what we’ve learned. You could get reeled in too! There are as many ways of dealing with acorns as there are folks who have done the deed. What I share below is how we did it, not a comprehensive project, but a successful one. 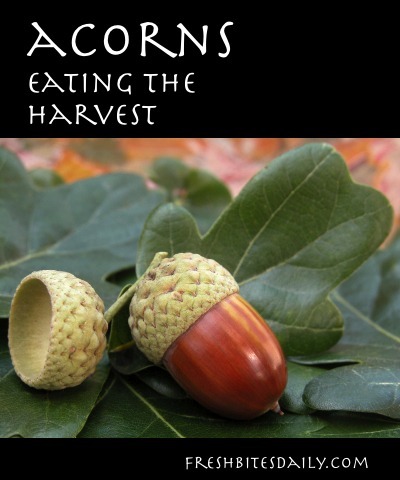 I started out reading through Acorns And Eat ‘Em by Suellen Ocean, a free pdf. The instructions are clear and encouraging. I trust mine will be, as well. Here we go! For best results, gather your acorns in the fall when they first drop. Bringing them indoors where they can stay dry will cut down on loss from mold. You may be able to find good acorns even into the spring, but probably not the bountiful fall crop. Check for mold. If the acorn meat is still white or light colored, you have a good acorn. Even if the acorn has begun to sprout it is ok as long as the acorn meat is not green. It could be pinkish. That’s OK too. TIP: The green acorns that fall early are not ripe and probably have worms in them. Wait for the darker acorns to fall before you harvest. If they all fall in a green state, do not shell them until they turn brown. Brown is ripe! TIP: An acorn with a small hole in the shell has a worm in it. Toss it! Not all acorns are equal. Some have more tannin than others. Tannin is what makes the acorn bitter and what needs to be leached out before cooking. A simple test is to taste a freshly fallen acorn. Some trees produce acorns that need little leaching. Others grow acorns so full of tannin you may not consider them worth the trouble. Find the right source and you won’t have to work so hard. TIP: The larger the cap on the acorn, the more tannin inside it. Look for an oak variety that produces large acorns with small caps. TIP: The flavor of the acorn can vary from one oak variety to another. Find one you like. TIP: One way to test for good acorns is to “float” them. Put the acorns in a large vessel of water. Any floaters have holes, which means they have worms. You may find a worm in a non-floater, but not often. Acorns can be stored for months if they are kept dry. Somewhere in my reading I came across a story of a family that dedicated one small empty bedroom to acorn storage. They blocked the bottom half of the doorway and poured in acorns. Every week the children were lifted over the door barrier to stir up the acorns. Stirring kept the acorns from building up moisture on the bottom. Moisture can bring mold. Not good! The children were light-weight enough to not crush the nuts. They considered this job great fun. My grandsons would agree. You can find pictures of huge Native American baskets placed on elevated platforms for acorn storage. The basket allowed for circulation. The platform discouraged four-legged marauders. What we did was sort through the acorns, keeping the best, tossing the questionable ones. The acorns are in large open containers. It’s no problem stirring the harvest once a week. We can do it by hand. There is no need to drop in a small child! The containers live in a room that is wood-heated. Each week a number of acorns split open. We believe the heat is causing this. What a bonus! The acorn meat pops out of the shell. If you keep the acorns long enough, they will begin to sprout. Sprouting acorns are in their sugar stage and easier to digest than the unsprouted acorns. Sprouting also helps to split the shells. Early in the fall I had gathered some acorns to try as a chicken food supplement. They were green (not ripe, though I didn’t know that at the time) and hard as rocks. Even Alastair, who has a hammer addiction, gave up. What we discovered is that acorns crack more readily after several days of drying indoors. You still need a heavy hammer. Remember, the Native Americans used rocks for this process. It’s still a fine idea if you have the proper surface for using a rock. TIP: To speed up the drying process, place a single layer of acorns on a cookie sheet. Keep them overnight in the oven with the heat of the pilot light. A number of acorns will split open, greatly simplifying your task. I’ve read that this process reduces flavor. I do not know this from experience. TIP: If you have loads of acorns (like us) and are not in a rush, just wait for the acorns to crack open and forget the hammer or rock. Every week I shell out the acorns that are cracked and store the nutmeats in the freezer until I have enough to do a large leaching project. 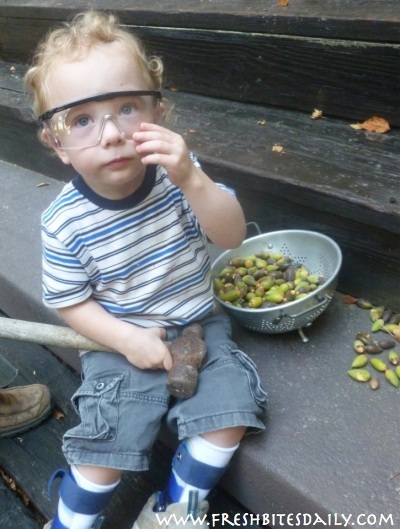 My grandsons love sifting through the acorns to find ones that qualify. It’s quite the tactile experience! TIP: If the acorn meat shows signs of bugs or dark spots or mold, throw it away. 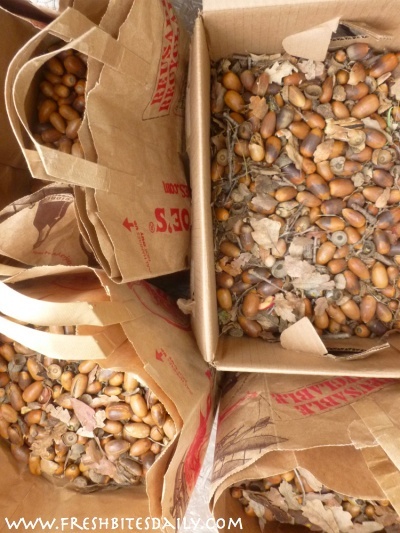 TIP: One gallon of acorns produces about 1/2 gallon of shelled acorn meats. Tannin has been used to tan animal hides, dye wool, treat some external skin conditions. However, extremely high levels of tannins found in acorns make most varieties of acorn virtually inedible. You must get it out of your acorn meat before eating. Besides being bitter, this quantity of tannin is hard on your kidneys. Get rid of it with a leaching process. You can read about a number of different leaching processes. I chose the slow, cold water method. It made the most sense for my personality and our life-style. Place the shelled acorns in the food processor or blender. Grind up the acorns until they resemble a very coarse corn meal. Pour the acorn meal into a large-mouthed jar. I used half gallon and one gallon sized jars for this. Cover the acorn mix with about three time as much cold water as acorn. Cover the jar with a lid and refrigerate. So far, I’ve been able to line up my jars on the back porch because it’s been so cold. This is great not to have a lot of room taken in the frig. Once or twice a day do some processing. Shake the bottle(s) vigorously to stir up the freed tannin. Pour the water out through a fine strainer. Add fresh water and shake. Put the jar back in the refrigerator (or on the back porch). Repeat this process until the water stays clear. You should also taste the acorn grits. If the tannin is gone, the acorn grits taste a bit nutty and slightly sweet. TIP: Plan on a week for this processing. Depending on the amount of tannin in your acorns it could be a longer time or a shorter one. Whether you are going to use the acorn grits or grind them into flour, they still need to be cooked. This is simple. Place the leached acorn grits into a large pan with twice the amount of fresh water. Simmer for 15 minutes, stirring the whole time. Your acorns could stick and burn if you do not do the stirring. Let the cooked acorns cool enough to handle. Pour them through a fine strainer or cheesecloth and squeeze out all the water you can. I prefer the fine strainer. We have them a three sizes, making the job easy. Store the cooked acorn grits in a tightly covered container in the refrigerator for up to 4 days or freeze the grits in amounts appropriate to your cooking. For instance, a bread we have fallen in love with calls for 1/2 cup of grits per loaf. I bake 4 loaves at a time and I freeze the grits in 2-cup amounts. TIP: I have found recipes calling for whole acorns. This is not a wise move unless you have access to one of the very few oaks that have no tannin in their acorns. To successfully leach the tannin in most acorns, the acorns must be first ground into grits to increase their surface area. TIP: Any recipes that I use and most of what I have read call for cooked acorn grits or flour (also cooked). If you find a recipe that does not give clear information on this, assume the acorns are cooked and proceed from there. We have been so consumed with enjoying foods with acorn grits, I have not gotten around to grinding flour. That will come. In the meantime, if you are interested in the flour, it’s simple. Let the cooked grits dry out on a cookie sheet with heat from the pilot light or in a dehydrator. Stir the grits occasionally during the drying process. Run the dried grits through a grain mill, a coffee grinder, or a grinding attachment for a Kitchenaid. Store the acorn flour in the refrigerator or freezer. It has oil in it that could soon go rancid. Acorn grits can be added to any bread recipe as a nut substitute: cookies, cake, quick bread. We’ve added the grits to bread recipes where we would normally not add nuts, like pizza dough and pancakes. The acorn grits add a complete vegetable protein. We have found that breads with the acorn grits stick to our ribs, keeping us full and satisfied much longer than breads without the grits. Some suffering from hypoglycemia find that acorn grits help prevent the sugar spike. Adding acorn grits to your cooked cereals or use the acorn grits AS your cooked cereal. Add them to your favorite stuffing recipe at Thanksgiving. Take the Native American route and use acorn grits as the thickener in a meat stew. Use in a salad dressing. Add to you meatloaf and meatball mix. Enjoy them in a dip. Hide them in gravies and sauces. Combine with omelet fillings like mushrooms and spinach. That should get you started. You will come up with a treasury of ideas once you experience the magic of acorns! You can easily work acorn flour into your favorite baked goods by substituting 1/4 of the required flour with acorn flour. This is not a big change to add some nutrient variety to the recipe. Since acorns are a bit sweet, you may need to cut down a bit on the sweetener you use in the recipe. Since acorns can vary so much from one variety to another, you will have to take this slowly and work it out yourself. 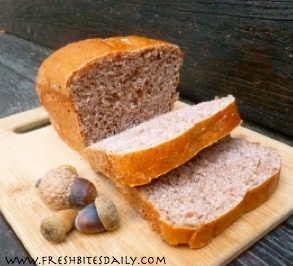 Acorn flour is gluten-free, which means it does not make a good risen bread on its own. It does make a decent flat bread. Stay tuned for specific acorn recipes! Valuable acorn information from the Green Deane, plus a seven minute video.